With Fall here and the abundance of the wonderful gourds available I think about recipes that can utilize these vegetables to the fullest. A few years ago when going out to dinner with my serious foodie crowd, I put up my nose when one friend ordered pumpkin risotto for their main course. We were at one of the city’s most famous Italian restaurants. We would all have a taste of everyone’s main on our bread plates before we started. 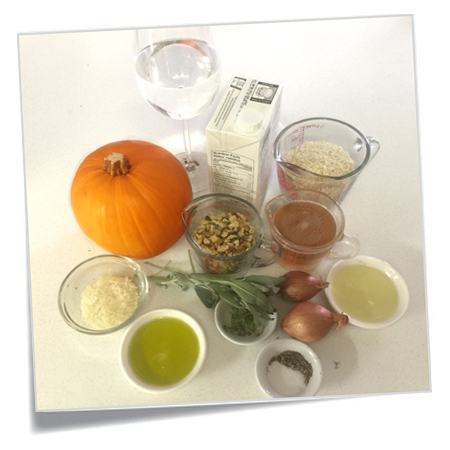 I was so taken aback that the pumpkin risotto was the best tasting! It was hands down the winning dish! I have been making it every fall ever since. The flavour is just stunning! Look for fresh pumpkin already cut and seeded in your grocery store so this recipe is not labour intensive. You would swear that there is butter and cream in this risotto but it is completely absent. 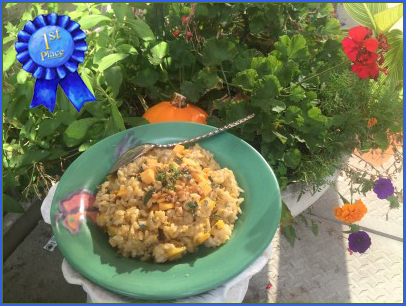 This is partially due to the cooking method as well as the substitution of the classically used arborio rice with CARNAROLI Rice. It is amazing! If you do use a fresh whole pumpkin keep the shell to serve pumpkin soup (which you can use canned pumpkin to make), steamed mussels, lamb ragout…. the list goes on. The presentation will be stunning for your Thanksgiving table. 1. Heat 4 cups of vegetable stock. Keep warm. 2. In a large heavy bottomed pan with high sides, heat oil over medium high heat. Add onion and cook until soft, about 3 minutes. Sprinkle with salt, about 1/8 teaspoon as the onions become sweet tasting. This helps to layer the flavours. 3. Add rice and cook a few minutes longer to coat all rice kernels in oil but not browning. 4. Add wine and stir until it is completely absorbed. 5. Add cider and ladle in hot stock one cup at a time. 6. Add sage and thyme and cook until all liquid is absorbed. 7. Before serving add walnuts, salt and pepper (to taste), olive oil and parmigiano. Most chefs will argue the cooking time should be only 18 minutes. It doesn’t sound like a lot but this is what they all claim. A chef’s school instructor told me that the famous chef who’s pumpkin risotto I fell in love with apparently just lets his risotto sit and cook without stirring and at the end he just gives it a toss. So far, I have been too scared to try this as I have put so many good ingredients in it but I will give it a try and give you a play by play report. This is an excellent vegetarian dish and if you eliminate the wine and cheese, this would make an excellent vegan dish. FOOD TIP: Make sure that you buy edible pumpkins and not the ones that are meant for carving. 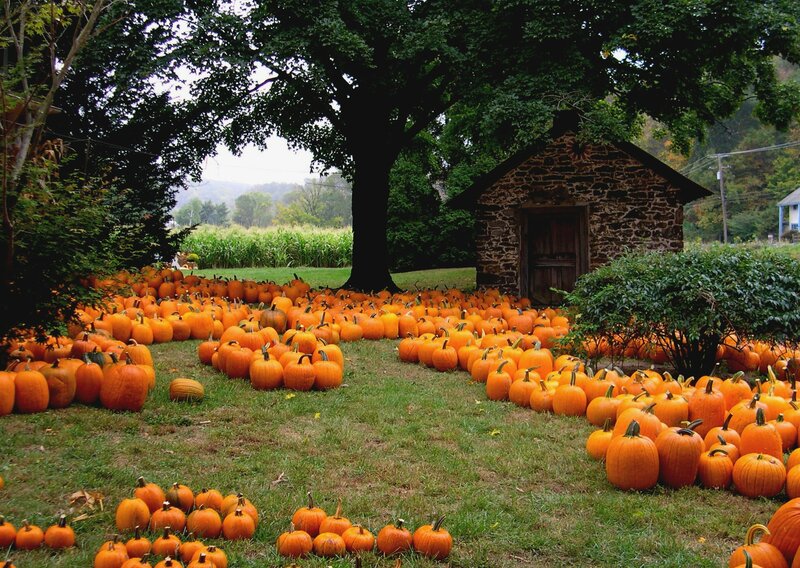 Pumpkins belong to the winter squash family along with butternut, acorn, spaghetti and others. The pumpkins that are grown for eating ( not carving ) are sugar pumpkins, sweet pumpkins, cheese pumpkins, pie pumpkins and some heirloom varieties. TASTE TEST: I baked my pie pumpkin in the oven for 60 minutes at 350F. After it was baked and cooled I opened a tin of pumpkin puree and tasted both of them. What a difference! The tinned pumpkin had a muddy taste while the pie pumpkin tasted like candy! I will never buy tinned pumpkin again! Pumpkin has many health benefits. They are a great source of carotene which is one of our major antioxidants that helps to protect us against certain kinds of cancer (particularly lung cancer) as well as heart disease. Pumpkin is rich in carotene which helps to manage blood sugar metabolism and aids in the health of the pancreas. Pumpkin contains many vitamins and minerals. It is helpful in the relief of bronchial asthma. and promote the health of the lungs and throat as well. European folk medicine acknowledges pumpkin as a potent remedy in the treatment of respiratory and digestive ailments.